Well, just when I get a bunch of stuff checked off my To-Do list, more stuff gets added to it. Plus I still have to clean up the Four-Play title screen a bit, finish the label art for it, finish the manuals for RPS and MGD, and I may take a crack at the power-ups for SuperBug. And of course, I need to spend some quality time with my 2600, too. Nice picture, I like how you put all the games you contributed artwork for on the front and back rows. Hope you enjoy all the games and I look forward to reading your reviews! Anyway, I eagerly await the tiles! You finally got your Krok Cart! hurray! It's a pretty cool piece of gear - I can't wait to start using it. However, my serial/USB adapter hasn't arrived yet, so I can only play the ROM Albert left loaded on it. Fortunately, I've got a few other games to keep me occupied. And thank you for doing that! I got my adadpter today, so I'll check out the programmable goodness tonight. Sweet! Let me know if you have any issues with Krokcom! Actually, the only problem I ran into, was that I didn't install the Keyspan driver initially, so of course, KrokCom couldn't see the serial port. It could, however, see Bluetooth, which I mistook for the serial port, until I actually read that the name of the port included the word "bluetooth". Naturally, this confused me as to why the Krokodile Cart wasn't responding. I would like to point out, however, that this wasn't entirely my fault, because I didn't realize there was a CD in the package. Only after numerous futile attempts at trying to figure out what was wrong, did I actually pick up the package to read it, and the CD fell out. Note: checking the product's website would have also worked. Anyway... at some point I'll probably put together a "Moron's Guide to Using KrokCom", since someone equally clueless may come along and buy one of these. And the Keyspan USB Adapter works great! (Once, of course, the software gets installed.) The nice thing, is that it includes a USB cable (how many products do that anymore), and can plug straight into the Krokodile Cart w/out an additional serial cable (I'll probably just send mine back to Albert). The only downside is it requires a powered hub, or direct connection to the computer, so I guess it's time to get a new USB hub. So... any chance of adding a GUI to KrokCom someday? Well, I ran into something weird with Pick 'N Pile. I e-mailed Albert about it, but it's not so much the cart as the binary (or perhaps, my 2600). On my six-switch 2600 (with a Cybertech video mod), when I load Pick 'N Pile, I hear music, but see static. This is present on the title screen, game select screen, and "get ready" screen. If I blindly move through them and manage to start a game, then all of the sudden the graphics appear, and things are perfectly normal (until the next "get ready" screen). On my four-switch 2600 (non-modded), the game works perfectly fine. To make sure it wasn't the cart, I loaded the NTSC binary onto the Krokodile Cart, and got the exact same behavior. Static on the six-switch, normal on the four-switch. All of the other carts I own work fine on the six-switch - except Midnight Magic. Midnight Magic will not work about 2/3 times I power it up. I have to cycle the power a few times in order for the game to come up, then it's fine (although depending on which demo loads up, sometimes the game will reset after a minute). When it doesn't come up, I get static and a high or low buzzing sound. On the four-switch, it comes up fine almost all of the time (it might miss 1/10 times, but it does so with a black screen - not static). When I loaded the Midnight Magic binary into the Krokodile Cart, it seems to load properly on the six-switch almost all of the time (7/10 or better). When it doesn't, there's just static - no buzzing. I'm guessing that Midnight Magic must randomly load one of several demo modes (I've seen several different ones on the four-switch), and something in my six-switch doesn't like what's happening on some of them. So could this issue be affecting Pick 'N Pile, too? Or do I just have a weird Midnight Magic cart? I'm rather attached to this 2600 (it's my original one from nearly 25 years ago), and would like to keep using it (99.9% of the time, it's fine). But if it's something I can actually repair and return it to 100% working status, so much the better. 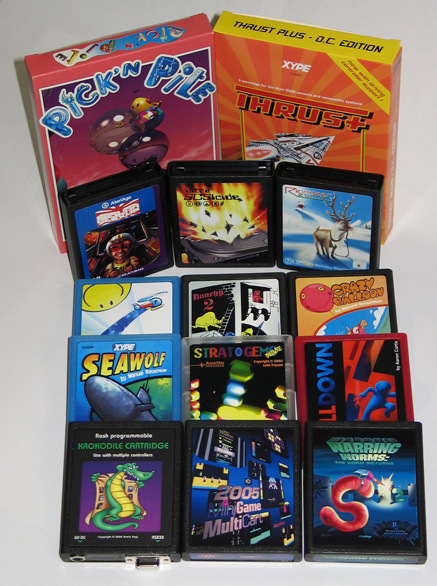 Is it just something odd in the Pick 'N Pile conversion (and my Midnight Magic cart)? GUI version is planned, but I've been kinda sidetracked by writing Medieval Mayhem, my own version of Warlords for the 2600. I can check out Pick 'N Pile tonight. I've seen similiar problems on other games in the past so I'm guessing either the game is an unsupported bankswitching type, or the type was incorrectly selected prior to loading it into the cartridge(ie: maybe the cartridge has extra RAM but the cart type w/out RAM was picked). I'm planning to port Stella's cartridge type detection routines over to Krokcom for the next update. silly me - I thought you were loading Pick 'N Pile into the Krok Cart. I just saw that it's one of your new arrivals from AtariAge. Try loading the binary on a F6 multicart and start it from the menu. What happens then on your 6-switch ? I looked at the binary - it seems to have VBLANK in a bad place. Try this binary on your KC and see if it works. I can't figure out how to set up a multicart. I'm trying to interpret from the PC Krokodile Commander instructions to the Mac's command line terminal, and not too successfully. You sir, are the man! That worked perfectly. We should bring this to Albert's attention, so he can use the corrected binary in the future (and hopefully replace my cart). Use the m command(instead of f) to load a multicart text file. KrokCom will on-the-fly load each ROM image into the Mac's memory. Once that's done use the s command to send it to the Krok Cart. 3rd line(and up) list games. I copied most of this info from the readme file included with KrokCom. Look for the section right after Step 6- Quit titled MultiCart Creation File format for more indepth information. NOTE 1: the documentation recommends using a terminal editor to create the text file so you could use drag & drop to add in all the /fullpath/romfile.bin entries. As of OS X 10.4 you can use TextEdit and drag & drop will now put /fullpath/romfile.bin. In 10.3 it would leave off the path and just put the filename. NOTE 2 : There's a minor bug that will cause the last line of the text file to not be processed. To work around it just hit ENTER after the final /fullpath/rom so the last line of the text file is a blank line. I'll use this version in the future, and for the replacement cart I'm sending you. Ohhhh... one filename per line. That must have been the problem. I just dumped them into the terminal app w/out line breaks. Plus I didn't know you specified cart and TV type in the first two lines. I'll try that out tonight. It does? All it does on my Mac (10.4.5) is drop the icon into the window. Wait a minute... (checks preferences, changes it to "plain text") okay. Now it works! I was wondering about that - I'd been trying to copy/paste file names of images in there, and it kept just putting in the images themselves. What exactly did you do? Just removing VBLANK after VSYNC? Since I didn't touch VBLANK in the conversion, it seems that PAL is more tolerant here than NTSC. EDIT: Found the difference, the VBLANK has just been moved from directly after to directly before VSYNC. Together with my experience with Splatform (no VBLANK at all, screen rolled on some TVs when background was flickering) it seems that you either have to use VBLANK during VSYNC or at least keep the background dark.